Publisher Lab – Templates 4.4.2 – Unique page-template designs for Apple Pages. Publisher Lab for Pages (was Templates for Pages, then was Template Lab for Pages) includes a large range of templates, providing a wide selection of documents, from business cards and jewel case covers to brochures and books. Some templates contain up to 28 different sections, so the package provides an ample array of layouts to meet your most exclusive requirements. Each and every layout — from the basic graciousness of text-only pages to the vivid mix of pictures and slogans in the poster and photo album template collections — features top design quality, set apart by attention to detail, high usability, and abundant creativity. Next story iSkysoft Phone Transfer 1.7.4 – An Excellent and Safe Phone Transfer Tool. Previous story PullTube 0.11.11 – Video downloader. 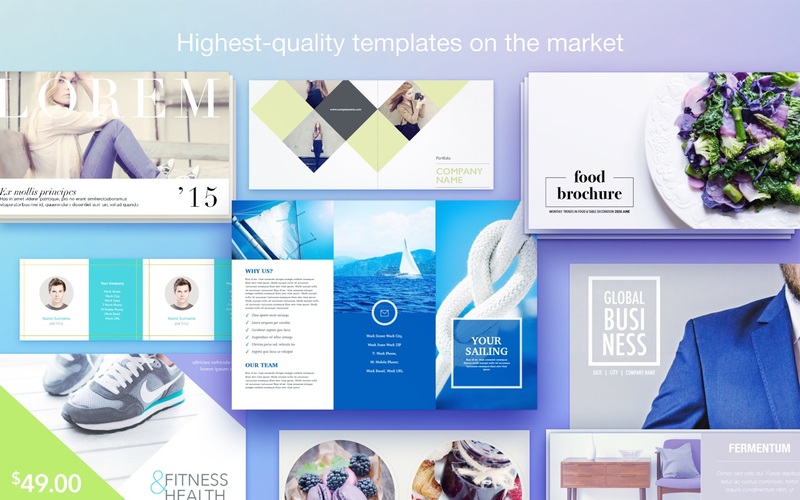 Flyer Mill 1.6 – Templates for Pages. Graphic Styles 3.0.2 – Collection of elements for Keynote presentations.